Take part in fast and furious sword fighting duels on the medieval Arena! Cross your sword with the most famous and honorable knights of the kingdom! Attack your enemies with deadly super hits and combos! Become the champion of global leaderboards and earn glory and treasures! Choose what you prefer most: a fast sword, a heavy crushing mace or a sharp war axe. Unlock new various armors, shields and weapons. Improve your equipment and try out different combat tactics. Use super hits and combos smartly to defeat even the strongest warriors. Fight in various stunning locations either jousting arenas or dungeons. 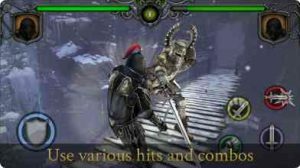 Knights motion-capture animations immerse you in medieval swordfighting battle like never before.